Press TV – Iran’s President Hassan Rouhani has inaugurated four new phases of the huge offshore South Pars gas field in a move, which has been seen as a clear sign of the failure of US sanctions against the country. 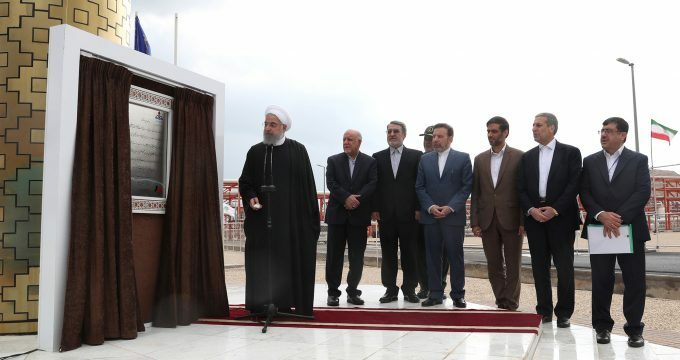 During an inaugural ceremony in the southern coastal city of Kangan on Sunday, Iran’s president officially launched phases 13, 22, 23, and 24 of South Pars gas field, noting that despite all the US pressures on the Iranian nation, especially through the imposition of unilateral economic sanctions, Iranians remain steadfast and resistant and continue to progress. The inauguration of the new phases of Iran’s South Pars gas field has been seen by experts as a clear sign of the failure of US sanctions against the country’s energy sector, which were mainly meant to curtail Iran’s production of oil and gas as its main revenue sources. US President Donald Trump withdrew Washington in May last year from the landmark Iran nuclear agreement, known as the Joint Comprehensive Plan of Action (JCPOA) reached between Iran and the P5+1 group of countries in 2015, and decided to re-impose unilateral sanctions against Tehran. “Before being an economic war, sanctions are psychological war through which America is trying to make the Iranians pessimistic about their future … and make them think that as time goes by, their conditions will deteriorate,” Rouhani said. In a TV interview back in February, Iranian Oil Minister Bijan Zangeneh said the country has become self-sufficient in gasoline production despite US sanctions on its energy sector. His remarks came after President Rouhani inaugurated the third phase of a gas condensate plant, known as the Persian Gulf Star Refinery, in the southern city of Bandar Abbas. The gas condensate plant supplies various petroleum products, including diesel fuel, gasoline, hydrogen, sulfur and jet fuel. “Fortunately, we do not need to import gasoline anymore. We have reached self-sufficiency. We can export our produced gasoline, but have no export plans,” Zangeneh was quoted as saying by the Islamic Republic of Iran Broadcasting. According to a report by IRNA, Phase 13 of South Pars gas field has four offshore platforms, 38 wells and four 90-kilometer pipelines, and has been completely designed and made operational by Iranian experts. The phase is to produce 56 million cubic meters of gas, 75,000 barrels of gas condensate, and 400 tonnes of sulfur on a daily basis in addition to annual production of 1.5 million tonnes of liquefied petroleum gas (LPG) and one million tonnes of ethane. Total value of the phase 13’s products has been estimated at five million dollars per day. South Pars Phases 22, 23 and 24 consist of four offshore platforms, 38 wells and three pipelines, which have been completely designed and made operational using Iranian equipment. They will transfer two billion cubic feet of gas to onshore facilities. On the whole, the four phases are to produce 56 million cubic meters of gas, 77,000 barrels of condensate and 400 tonnes of sulfur per day in addition to annual production of 1.5 million tonnes of liquefied gas and one million tonnes of ethane. The daily value of their products has been estimated at 30 billion dollars. The inauguration of the new South Pars phases will also increase Iran’s current production capacity by 113 million cubic meters of enriched gas, 100 million cubic meters of methane, 150,000 barrels of condensate and 800 tonnes of sulfur granules per day. On an annual basis, the country will be producing 2.1 million tonnes of liquefied gas and two million tonnes of ethane as the main feed for petrochemical plants. The four new phases of South Pars gas field have been made operational at a cost of more than 11 billion dollars, enabling Iran to outdo the neighboring Qatar in gas production from the joint field for the first time.